Unison has become the UK’s biggest trade union, with over 1.3 million members in both public and private sectors. They work in diverse industries from education, local government and the NHS to the police service and energy sector. Today the trade union is celebrating the achievement with a month of recruitment activity, where reps will be aiming to reach every worker in the UK who helps to provide public services. The new campaign, which seeks to increase recruitment and retention levels, is called ‘Grovember’. Throughout the next few weeks, the new recruitment drive will see workers in towns and cities across the country told about the benefits of Unison membership, particularly in a time of austerity during which public service jobs have been cut. To help activists recruit members to the union, Unison has a guide that runs through 16 responses to arguments people might make against joining, from the cost of membership to its Labour Party affiliation. Unison general secretary Dave Prentis commented: “I’m proud that Unison is now officially the UK’s biggest union. 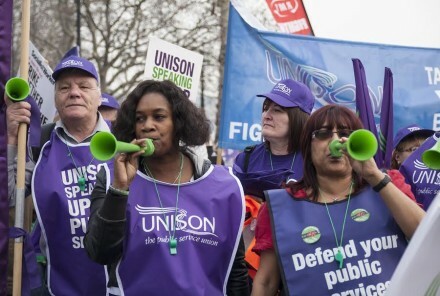 Despite almost a decade of austerity, which has decimated public service jobs, Unison is a strong and growing union.